Instantly revives colour, intensifying colour tone and shine. 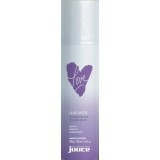 New Juuce Love Pastel Lilac Spray! Fabulous instant spray in colour that washes out. .. Adds violet tones to lighter hair. Instant hair colour + nourishing treatment will create violet .. Adds soft pastel pink tones to blonde hair. Instant hair colour + nourishing treatment will creat.. Adds soft mauve tones to blonde hair. Instant hair colour + nourishing treatment will enhance and..
Juuce Love Beige is ideal for blonde to very light blonde hair. Instant hair colour + ..
Juuce Love Caramel Brown 220ml Juuce love Colour condi..
Juuce Love Violet Blue Conditioning Colour Treatment 220ml Juuce Love Viol..
Juuce Love Red 220ml Juuce Love Red Conditioning Colour Treatment is..
Juuce Love Copper 220ml Juuce Love Copper is ideal to enhance /.. Ideal for medium brown to light brown hair. Instant hair colour + nourishing treatment adds warme..
Juuce Love Blue-Black is idea for very dark brown to black hair. Instant hair colo..